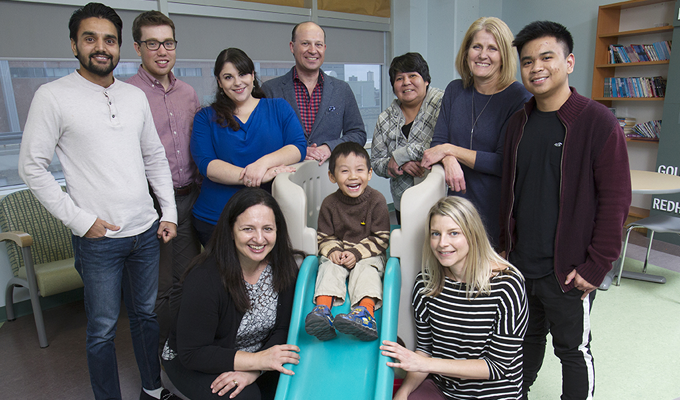 Five-year-old Jeffrey comes bounding down the stairs at the Andrews Street Family Centre with a huge grin on his face, and his three small braids swaying. He runs to his mother, Kim Little, for a quick hug before being warmly enveloped by a half-dozen other adults gathered in the basement of the inner-city centre. Those adults include two dentists - Dr. Robert Schroth and Dr. Khalida Hai-Santiago - as well as a dental hygienist, a public health grad student and other members of a special oral health interdisciplinary research team (IRT). The team has gathered at the centre on this cool Monday morning to conduct a free pediatric dental screening clinic and recruit community members for a new baseline study about early childhood tooth decay. 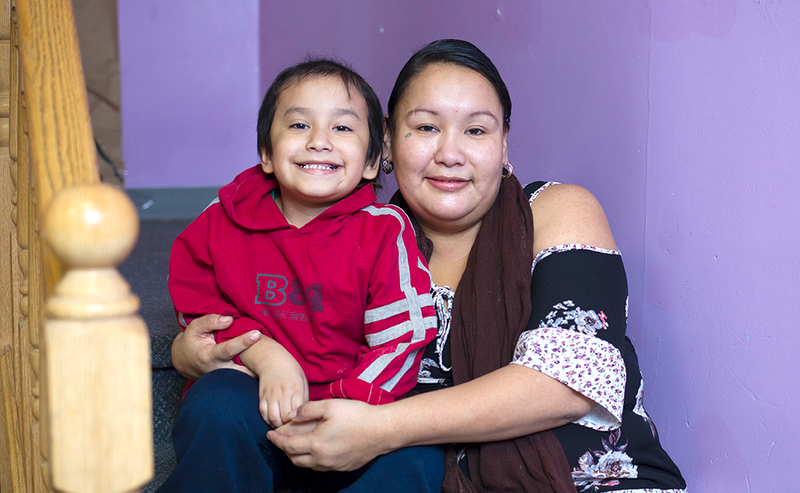 Jeffrey is a student in the Oshki-Majahitowiin Headstart program, which operates upstairs on the main level of the family centre. He is one of 14 children under the age of six having his teeth examined today by Drs. Schroth and Hai-Santiago. The dental examinations, which take only a few minutes, are conducted after the child's parent or caregiver completes an extensive, multi-page questionnaire about their family, dietary habits, oral health habits, and knowledge and attitudes relating to early childhood oral health, with the assistance of one of the IRT members. 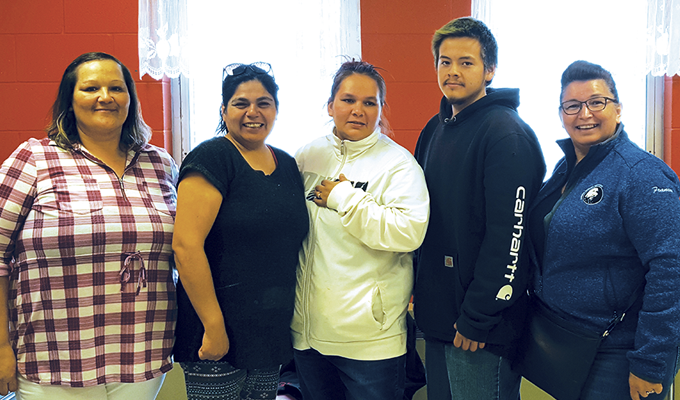 Members of the Abinoje Head Start Program in Duck Bay, from left: Ruby Chartrand, Clarice Genaille, Monica Genaille, Brandon Chartrand. Far right: Frances Chartrand, Vice President of the Manitoba Metis Federation's Northwest Metis Council and the Minister of Health & Early Learning Child Care. 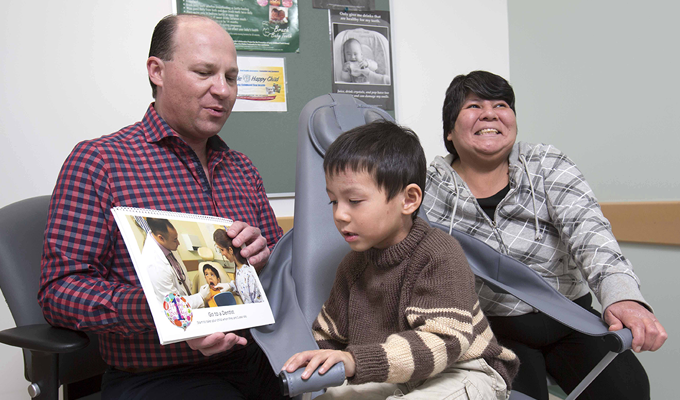 Both the questionnaires and the dental screenings are part of an effort to identify ways the Healthy Smile Happy Child initiative can be scaled up to provide better early childhood oral health promotion for First Nation and Metis children in Manitoba. Healthy Smile Happy Child is a collaborative, community-based, multi-agency project designed to better detect and prevent early childhood caries, more commonly known as tooth decay. Childhood caries is a major health problem in Manitoba. Studies shows that as many as 40 per cent of kids in this province will have at least one cavity affecting their primary teeth by the time they reach the age of six years. In addition, it is estimated that as many as 3,000 preschool children will undergo pediatric dental surgery to address tooth decay in any given year. Healthy Smile Happy Child was conceived in 2000 to deal with these issues. The program addresses the wait times, risks and costs associated with those surgeries, as well as the causes and condition of childhood caries and the social determinants of health that contribute to those causes and condition. But there is still more to be done, particularly in the Indigenous community. "We need to present to parents other ways to prevent and manage tooth decay in young children, including alternatives to general anesthetic," says Schroth, one of the leads behind Healthy Smile Happy Child. "Past research indicated that the Healthy Smile program does make a difference, so we decided to scale up to Indigenous and Metis communities." In order to do so, the initiative has developed a multi-step process that involves identifying oral health policies and practices that need to be changed; providing sound evidence-based alternatives to those archaic policies and practices; and monitoring how those alternatives affect children's oral health and overall well-being, as well as their parents' actions and awareness regarding dental health. The Healthy Smile Happy Child scaling up initiative is committed to the Spirit of Reconciliation and to respecting and supporting traditional teachings regarding oral health. 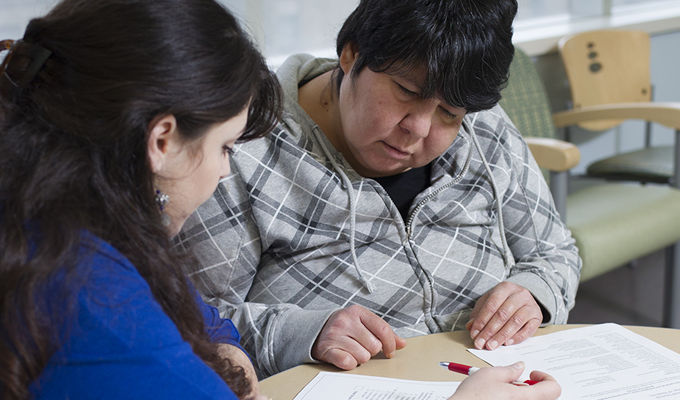 It is working with a variety of stakeholders, services, communities and First Nations and Metis partners, including the Manitoba Metis Federation (MMF) and Nanaandawewigamig, the First Nations Health and Social Secretariat of Manitoba (FNHSSM). 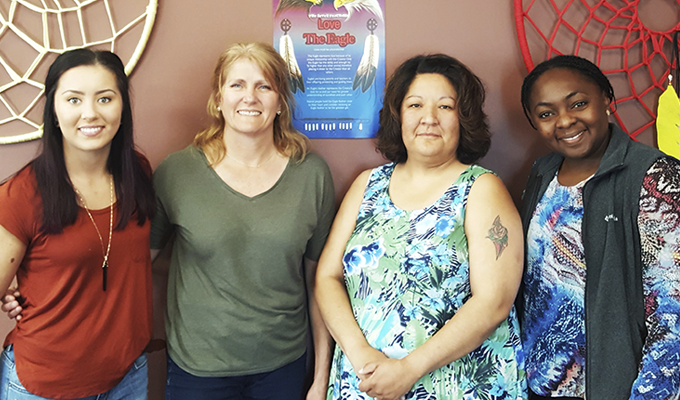 "FNHSSM's role is to ensure First Nations children have access to dental care for prevention, promotion and treatment all over Manitoba," explains Rhonda Campbell, the organization's Nurse Program Advisor for Strengthening Families Maternal Child Health. "We participate in the knowledge exchange related to Healthy Smile Happy Child and we also participate in research activities as knowledge users." To that end, this past summer, the Metis communities of Camperville and Duck Bay, as well as the First Nation of Pine Creek, participated in a series of sharing circles, consultations and focus groups facilitated by the Healthy Smile, Happy Child team. Community stakeholders, parents and caregivers in Point Douglas, where the Andrews Street Family Centre is located, were also invited to share their perspectives in a series of neighbourhood focus groups. "In the focus groups we asked them about their knowledge, attitudes and behaviours around oral health for very young children," explains Daniella DeMaré, the Healthy Smile Happy Child program co-ordinator. "We asked them about their different practices, where they get their information from, what they would like to see and what would be useful to them." The information from those meetings will be analyzed, along with data from the baseline dental examinations and parent-caregiver questionnaires, and used to improve prevention messages and provide better care, she adds. Childhood caries is identified by the presence of decayed, missing or filled primary teeth in young children. On a most basic level, it is caused by bacteria-consuming sugars in food and drink that increase the acid levels on vulnerable tooth surfaces. "Parents don't necessarily know about the risks involved from such things as the natural sugars in beverages they give their children, even milk," Schroth says. But childhood caries, he continues, is much more complex than that, as it results from many underlying and interconnected factors. In addition to improper feeding practices, these other considerations include limited or no access to fluoridated water, limited access to healthy food, and limited oral health education and oral health services. "There is a higher incidence of childhood tooth decay in Indigenous communities related to access and economics," says Schroth. "Those in Duck Bay, Camperville and Pine Creek, for example, have to go to Dauphin, an hour away, for care. And some communities are so small that they don't have true medical centres." Childhood caries does not just affect teeth. It can detrimentally impact speech development and eating and sleeping habits, and has been associated with malnutrition, anemia and iron and vitamin D deficiencies in children. "As a nurse working in communities, I see a lot of severe dental caries requiring treatment," Campbell says. "The effects of dental caries is damaging to children. We need to do more health promotion and prevention at the community level." The exact nature of that promotion and prevention will largely be determined by what Schroth and Hai-Santiago observe during their dental screenings and by the responses that the Healthy Smile Happy Child team receives to their questionnaires' probing inquiries. Learning how often and for how long children are being bottle-fed, snacking and brushing their teeth will help the team determine exactly where awareness is lacking and what behaviours needs to be adjusted. Healthy Smile Happy Child team in Pine Creek, from left: Kaili Gilroy, oral health promoter, Daniella DeMaré, project co-ordinator, Paula Richards, community health representative, and Grace Kyoon Achan. "The questionnaires are quite intensive," says Hai-Santiago, who serves as Manitoba Health's oral health consultant. "It asks parents and caregivers what they are doing with their children and why are they doing it. But the approach is not judgmental." "This initiative is very grassroots and very different from a suburban practice," Hai-Santiago continues. "We are getting parents to think about how they are providing care. And clients really appreciate that we come here." Jeffrey's mother is one of those appreciative clients. Two and a half years ago, when Jeffrey was still a toddler, he was diagnosed with severe childhood caries and had to be put under general anesthesia in order to have several of his top baby teeth capped with stainless silver crowns. With his molars just starting to come in now, Little is determined to avoid further dental surgeries and to keep her son's permanent teeth strong and healthy. "He hasn't been to the dentist since his surgery more than two years ago, so I wanted to make sure he's okay," Little explains. In order to check that Jeffrey's teeth are okay, Schroth invites Little to sit on the small chair opposite his and then instructs the boy to climb on to his mother's lap, turn to face her, and lean his head all the way back so that he's looking up at the dentist. As Jeffrey 'opens wide like a lion,' Schroth puts on a pair of sterile gloves and gently begins examining the child's teeth, making small talk with the boy and his mom as he does so. He then hands the dental mirror off to Hai-Santiago who takes her turn scrutinizing Jeffrey's teeth before picking up a thin brush and 'painting' them with a fluoride treatment. When the paint job is complete, the dentists briefly consult with each other and then suggest that when she has a chance, Little should take Jeffrey back to her family dentist, or to a dentist at Mount Carmel Clinic or her local ACCESS centre, to have a silver diamond fluoride sealant put on his teeth to protect them from further cavities. This is the same advice that they give to the parents of almost every child they check in their dental screening clinics. "Most patients' teeth are really good," says Hai-Santiago. "Public health nurses are getting the information out to parents. Still, we see pockets of children with some issues and we make sure they have somewhere to go or we refer them to their dentist or to a place they can access. We won't let problems linger." Having clambered down from his mother's lap, Jeffrey, who is still all smiles, walks hand in hand with program co-ordinator DeMaré to a table set up at the back of the room to choose a Blaze Monster Machine themed toothbrush and toothpaste to take home with him. As he is doing that, five-year-old Lacey, one of Jeffrey's Headstart classmates, climbs into her mother Mandi Morrisseau's lap and leans her head back so that Schroth can count her teeth. When he is done, Hai-Santiago moves in again, paintbrush in hand. Lacey then climbs down from her mother's lap to make room for her brother August, who is almost two and is having his teeth examined for the first time. "I brought him here because I worry about tooth decay and I wanted him to get fluoride," Morrisseau says. "It has been a positive experience coming here," she adds. The Healthy Smile Happy Child initiative is all about creating positive dental health experiences for children. After all, the focus groups, the consultations and the sharing circles, like the questionnaires, the ad-hoc clinics and the check-ups, all share the same objectives - to prevent childhood caries, to reduce the number of childhood dental surgeries performed under general anesthesia, and to enhance overall oral health. To that end, the Healthy Smile Happy Child team is committed to ensuring that children like August, Lacey, Jeffrey and Boi, will always have access to early dental check-ups, and that their parents will have ongoing access to resources and information about how to prevent early childhood tooth decay. Working closely with existing maternal-child health programs, community services and Indigenous community Elders, the Healthy Smile Happy Child team will design cultural activities and promotional events to relay vital messages about the value of primary teeth and the harm caused to those teeth by baby bottles, sippy cups and sugar. It will also work to enhance access to such basics as toothbrushes, toothpaste and fluoride, encourage breast feeding and healthy diets, and continually reinforce the message that childhood caries is preventable and that every child deserves a healthy smile. Bottles and sippy cups pose can pose potential problems for your child's dental health, especially if they are used for juices and other sugar-laden drinks. That's because the sugar in the liquid can rest in a young child's gums. Do not put baby to bed with a bottle (unless it contains plain water). Serve unsweetened juice and other sweet drinks in a regular cup. Wean baby off the bottle and sippy cup to a regular cup by 14 months. Breastfeed, as breastmilk alone has a low chance of causing tooth decay. Here are some tips for taking care of your child's oral health. Want to brush their teeth when they see you brushing your teeth - great! Be motivated to brush longer with helpers such as an egg timer. Enjoy getting a small reward once they complete their own toothbrushing chart - a good way to encourage good brushing habits!